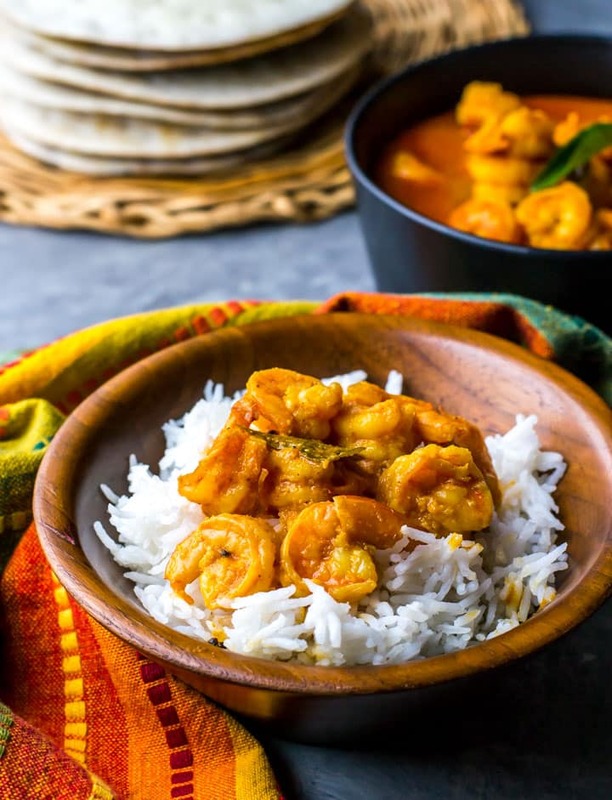 Authentic and flavorful – That’s how you would describe this Mangalorean style shrimp curry (Prawn gassi) recipe. Serve it over cooked rice or dosas for a complete gastronomic experience. 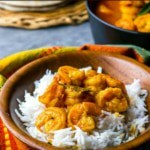 Prawn gassi is popularly known as yeti gassi is Mangalore where yeti means prawns and gassi stands for curry. Just like Mangalorean fish curry (meen gassi), the spice and the tangy flavors in this dish draw you in. Serve it hot with rice or dosas for a delectable meal. 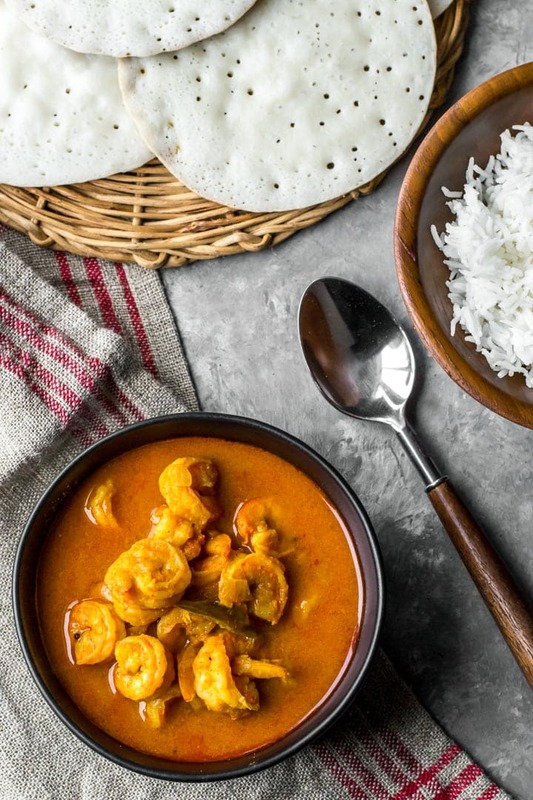 When I was growing up in India this prawn curry was mostly a weekend fare considering how expensive prawns were during the 80’s. Think of it more like a delicacy that was served as a special treat or when we had guests. Are prawns and shrimp the same? They are in fact different species. Here’s an infographic that explains the difference between shrimp and prawn in an easy to understand way. They do taste almost the same and hence they can be used interchangeably in recipes. 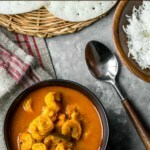 Most Mangalorean fish curries (meen gassi) including prawn gassi get their unique tangy flavor from Jaargey (picture below). Jaargey is the dried exterior of a fruit local to Mangalore. NOTE – Jaargey is not easily available if you don’t live in India, so again, despair not, tamarind that’s a lot more universally available, does the job just as well. (PS – if you live in India, most Mangalorean stores carry jaargey). To get the most flavor out of jaargey, soak it in water overnight or a minimum of 6 hours. If you are short on time, soaking it in hot water for 10-15 minutes should work too. The water turns a pale yellow and has a unique tangy flavor – a tad sour but mostly something that just excites your taste buds. Soaking jaargey in hot water for about 10 minutes or overnight for best results. Grinding the jaargey + water, coconut, turmeric powder, chili powder and the roasted dry ingredients to a fine paste. Start with heating the oil in an Instant pot or Stovetop. Add mustard seeds and when they begin to splutter, add curry leaves and fry them. In a few seconds, add onions and fry them till they are translucent. Add green chilies, ginger along with ajwain and methi seeds. Add the finely ground spice paste along with 1/2 a cup of water. Let the mixture come to a boil. Add shrimp and mix well. Continue to cook till it is done. If using an Instant Pot, pressure cook for 3 minutes under low pressure. Once the cooking cycle is complete, release pressure immediately. Serve hot with rice or dosas. 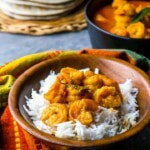 Authentic and flavorful - That's how you would describe this Mangalorean style shrimp curry (Prawn gassi) recipe. Serve it over cooked rice or dosas for a complete gastronomic experience. 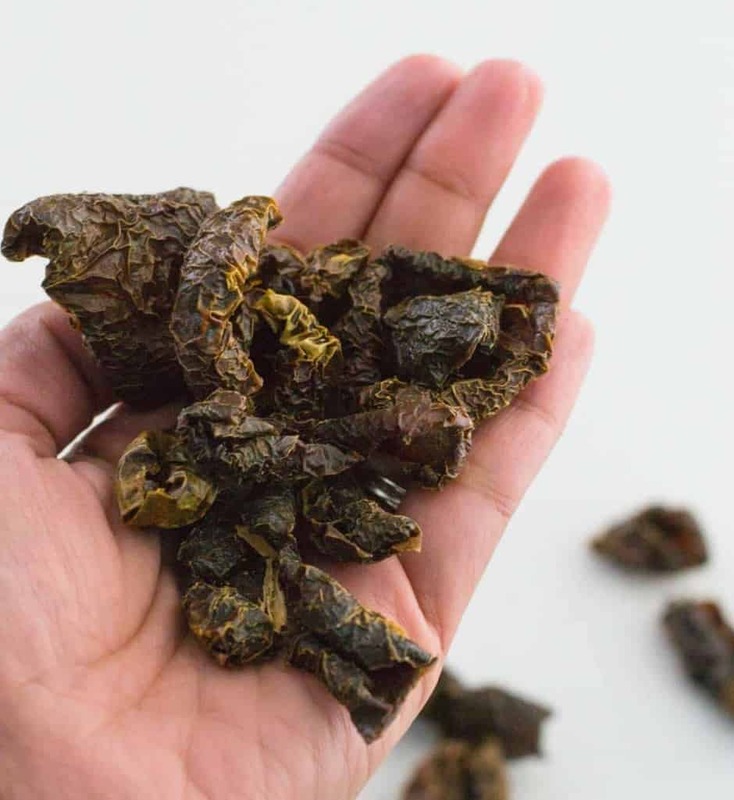 Soak jaargey in 1/2 a cup of hot water for 10-15 minutes or soak it overnight for best results. 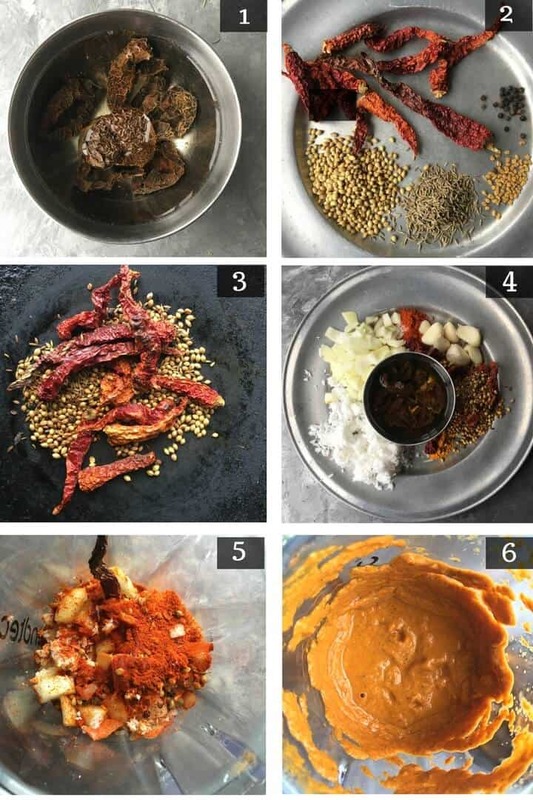 Grind the spice mix from step 2 along with garlic, onions, coconut, salt, turmeric and chili powder and the water from jaargey to make it into a fine paste. If using tamarind paste, add water as needed for grinding. Set it aside. Heat the oil in a medium-sized pan over medium heat and add mustard seeds to it. When they start spluttering add kadipatta to it. Let it fry for around 20 seconds and then add onions and fry them till they are translucent. Pound the ajwain and methi seeds to a coarse powder. Add the ground ajwain and methi seeds to the curry and mix well. Add the ground paste to the onions that were being fried and add water as needed (~1/2 - 3/4 cup) for a curry like consistency. When the gravy starts to boil over add the shrimp, green chilies, and ginger paste and cook till it is done. Choose the Saute setting and set it to normal. Heat the oil in the steel insert of the Instant Pot and add mustard seeds to it. When they start spluttering add kadipatta to it. Let it fry for around 20 seconds and then add onions and fry them till they are translucent. Add ground ajwain and methi seeds and mix well. When the gravy starts to boil over add the shrimp, green chilies, and ginger paste. Cover the lid, select cancel and adjust the pressure to low, and manually cook for 3 minutes. Once the cooking cycle completes, release the pressure by carefully turning the vent towards venting. Increase the chili powder from 1/2 to 1 teaspoon, if you like it spicy. Including green chili is also optional, but if you like your dish spicy as it is meant to be, then include it. Instant Pot cook time is about 3 minutes (for large shrimp) but it takes about 10-12 minutes to build pressure, hence the total cooking time is about 15 minutes. For smaller shrimp, cook for about 2 minutes. 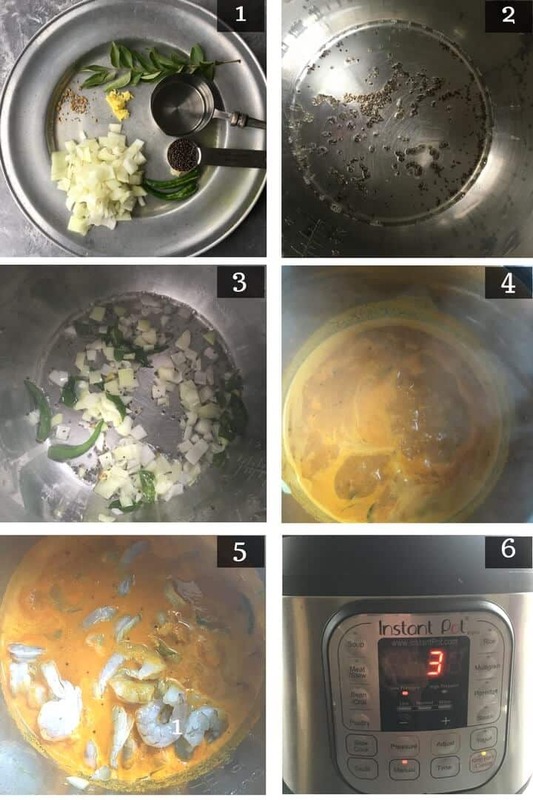 Unlike stovetop cooking, a curry cooked in an Instant Pot does not lose as much water. That's why the curry consistency before cooking should be what you want as a final result. In short, don't add as much water as stovetop cooking. I love making it in the Instant Pot because I don't need to check on the shrimp like I have to over a stovetop. Heyy thanks… i was really missing hotel signature style prawn ghassi since quite a long … tried ur recipe and guess what…. feeling satisfied? Glad you liked the recipe, Akshay!